Long Beach’s own “Irish” Seanie Monaghan sparred with his trainer Joe Higgins at the Freeport PAL on Oct. 19. Professional boxer and Long Beach’s own “Irish” Seanie Monaghan, right, sparred with his trainer, Joe Higgins, at the Freeport PAL on Oct. 19. On Nov. 3, the light heavyweight said, his career will be on the line when he faces Sullivan Barrera in the main event at Brooklyn’s Aviator Sports and Events Center. Monaghan will take on Sullivan Barrera, pictured, in a 10-round bout that is the main event. The headline fight will be streamed live on Facebook Watch via the Golden Boy Fight Night Page beginning at 9 p.m.
Higgins and Monaghan on Oct. 16. 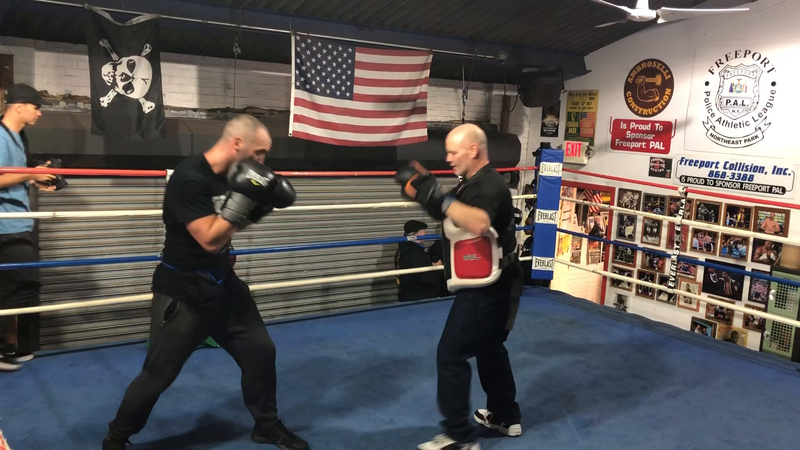 Although professional boxer “Irish” Seanie Monaghan hasn’t fought in a year, he’s been keeping busy in the ring and training regularly for what he described as the most important fight of his career on Nov. 3. Last November, the Long Beach resident and father of two children defeated fighter Evert Bravo at Brooklyn’s Barclays Center, a victory that came on the heels of Monaghan’s first and only professional career loss to Marcus Browne in July 2017. Now, Monaghan (29-1, 17 KOs) is looking to defeat Sullivan Barrera (21-2, 14 KOs) at Brooklyn’s Aviator Sports and Events Center. The 10-round fight, promoted by Main Events, is the main event and will be streamed live on Facebook Watch via the Golden Boy Fight Night Page beginning at 9 p.m. In March, Barrera suffered a 12th-round knockout loss at the hands of world titleholder Dmitry Bivol, but is still ranked fourth by the WBC in the competitive light heavyweight division. According to ESPN, Barrera and Monaghan were initially scheduled to headline the bout in August, but it was postponed after Barrera suffered an injury during training. Monaghan’s manager, PJ Kavanagh, said that a win could lead to a shot at the world title. Of course, hundreds of “Team Monaghan” supporters are expected to turn out for the headline event. Tickets ranging from $50 to $125 are on sale and available through Eventbrite or by calling or emailing Main Events at (973) 200-7050 and boxing@mainevents.com. Tickets are also available at the Saloon and Scout Design Shop in Long Beach. Call (516) 432-9185 and (516) 432-0208 for more information.